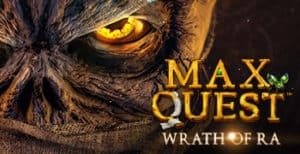 Max Quest: Wrath of Ra - The New Era in Gaming | Play Max Quest today! 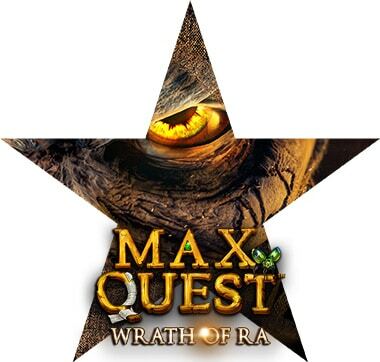 Betsoft Gaming is about to release what surely will be one of the greatest new slots in 2018; Max Quest: Wrath of Ra. This very controversial slot will take the players to a totally new way of gaming. We know, this is said about many games within the business. But this time it really seems to be the truth. So, what is so controversial about this one? Well, it is a multiplayer RNG (Random Number Generated) slot that also has an interactive shooting experience. You and your friends (or enemies) can be up to six people playing the game at the same time, fighting your way through the map in the search for XP, experience points. This really is a mix between an online casino video slot and a regular video game, something that surely will appeal to many players. Betsoft Gaming has even built an own website, only for this game. That says something about their determination and intentions about this game. You can find the website here: http://playmaxquest.com/. Bestoft themselves calls this a “genre-defining” slot game. And from what we can see so far, they are absolutely right. The game trailer shows graphics that we haven’t even been close to before and the interactive social gaming is probably exactly what the market is looking for right now. Especially the younger crowd that has grown up with social media and interacting with people online. Just as the live casino for table games has grown a lot over the last couple of years – social slots would be just the same. The game is placed in ancient Egypt. Maybe not a wow-factor itself, since we see a lot of slots doing precisely this. However, this is something else. You will be able to step into tombs within the pyramids, searching for the big treasures. Along with up to five of your friends. Exactly how the slot feature will look, we don’t know yet. And probably it will change from time to time, depending on how far you have progressed on the map. It is an action adventure, not online PlayStations best-seller Uncharted. Epic treasure lay unfound and your quest is to find them. Where to play Max Quest Wrath of Ra slot? Many new online casinos today are already having a partnership with Betsoft Gaming. Since this is a very exciting game, we are certain that all casinos that have Betsoft in their catalogue will add this game to the list. If Max Quest Wrath of Ra becomes such a success as we think, more casinos will most probably sign up to use Betsofts games as well. Just as many groundbreaking games, most casinos like to show them to its players. Therefore, we think that you can expect to get a big fat Max Quest bonus if you decide to play this once it is released. Make a deposit and get a nice deposit casino bonus on top of that to get as much playing time as possible. In normal cases, we would say that “of course you will get Max Quest free spins”. However, this is a totally new gaming experience, why we don’t know how Betsoft have decided to do. Most probably some kind of spins will be available – but to what extent and in what way we don’t know. However, making a slot without a free spins feature is not very common today. And Betsoft Gaming knows the appeal to players. So, just as scatter and wild symbols, free spins will probably show up. Just like every new casino game, it is well needed to work well on mobile devices. This is no exception. If you want to play a Max Quest mobile game, just log onto your favourite casino and start the game. Whether you choose to play from your computer, mobile or tablet, you will soon see that this is the new era of gaming. You can also try and play Wrath of Ra for free. Free play mode is something that many casinos of today offer its players. And with a new-thinking game like this, it might be extra interesting. How to win at Max Quest Wrath of Ra? The best answer to this at the moment of writing is; we are about to see. We don’t know about the RTP (Return to Player) for this video slot at the moment. Our guesses are that it might be a bit lower than most of the Betsoft slots, due to the cost of developing a groundbreaking game like this. Since it is a game ready to play in multiplayer mode, we suspect this being the best way to make big wins at Max Quest: Wrath of Ra. With these small bullets, we think we have summoned it up pretty well. Be sure to find some of the best new online casinos in the world ready with the Max Quest: Wrath of Ra once it is launched. Hopefully, our expectations aren’t too high and this really will change the way we look at video slots!